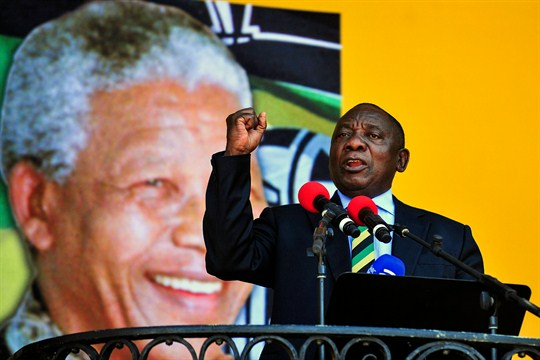 Cyril Ramaphosa, then serving as South Africa’s deputy president, delivers a speech marking the 28th anniversary of Nelson Mandela’s release from prison, Cape Town, South Africa, Feb. 11, 2018 (AP photo). Amid the drama last month of Jacob Zuma’s resignation as South African president and Cyril Ramaphosa’s subsequent inauguration, it was easy to overlook the resiliency of South Africa’s democracy during Zuma’s nine years in power, which were marked by poor governance, corruption and his authoritarian style. By the end, the political opposition, the judiciary, the media and the electorate all successfully exerted pressure on the ruling African National Congress to remove him. Zuma’s departure was a crisis for the ANC, but not for South Africa’s democratic institutions and the rule of law.